Desborough Town produced one of their best results of the ChromaSport United Counties League Premier Division season so far as they claimed a 3-1 success at high-flying Holbeach United. Jason Turner put Ar Tarn in front after 27 minutes before a fine effort from Dan White found the top corner to double the lead before the break. Debutant Taras Petranyuk curled home the third three minutes into the second half and that proved to be more than enough as Holbeach were only able to pull one goal back. It was also a fine day for Wellingborough Town as they ran in five second-half goals to beat Sleaford Town 5-0 and give Nathan Marsh his first win since taking charge. After a goalless first half, the Doughboys broke the deadlock thanks to Nat Ansu’s fine strike and it was 2-0 when Adam Speight found the bottom corner. Then it became the Deven Ellwood show as he hit a hat-trick to round off an excellent afternoon. Whitworth picked up a point on Friday night as they drew 1-1 at Oadby Town. The hosts took the lead through Josh Walsh but Jordan Pendered equalised to earn the Flourmen a point. Rothwell Corinthians’ disappointing run of form continued as they went down 1-0 at Cogenhoe United with Ryan Dove’s goal 13 minutes from the end proving decisive. Raunds Town remain well-placed in the battle for the second automatic promotion place in Division One, despite them being held to a 1-1 draw by Lutterworth Town at Kiln Park. James Lea gave the Shopmates a first-half lead but they were pegged by with 10 minutes to go as the visitors earned a share of the spoils. Elsewhere, Thrapston Town drew 2-2 with Olney Town at Chancery Lane while bottom side Stewarts & Lloyds went down 4-1 at home to Buckingham Town. 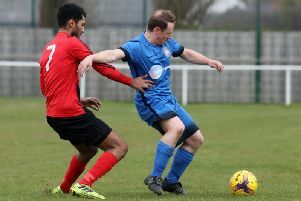 Irchester United and Burton Park Wanderers both missed out on a place in the NFA Junior Cup final as they were beaten in their respective last-four matches. The Romans saw their 10-match unbeaten run in all competitions ended as Peterborough League side Netherton United claimed a 1-0 success at Alfred Street. And Wanderers were well beaten in their semi-final as they went down 5-1 at Northants Combination Premier Division side Moulton.